Experience the Most Challenging Game of Avian Destruction All Year Round! An Angry Bird’s work is never done. All year long, the flock has to watch over their precious eggs and teach those darn Bad Piggies a lesson when they come in to make omelettes. They don’t even get a chance to take any time off during the holidays; the pigs never stop making a nuisance of themselves, even when they themselves should be taking it easy as well. Despite that, the birds still have their ways of getting into the holiday spirit even as they use their bodies to topple the swines’ many flimsy fortresses. See for yourself in Angry Birds Seasons, an enormous compilation of holiday-themed puzzles in the smash hit Angry Birds franchise. It has it all: all the birds we know and love, a few new faces, intense slingshot action, physics-based destruction, and some of the most dastardly difficult puzzles ever conceived in the series to date! 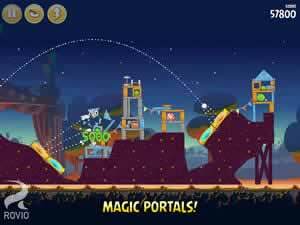 Angry Birds Seasons continues the franchise’s tradition of letting you smash up the pigs with your artillery of feathered friends. What sets this game apart from the rest is its massive quantity of levels, sheer variety of holiday themes, and the quality of the puzzles within. Play hundreds of levels, all of which are based off of various holidays and seasonal events. Experience the birds’ renditions of Christmas, Thanksgiving, Halloween, Saint Patrick’s Day, Chinese New Year, Easter, Valentine’s Day and more! Enjoy the many unique sprites, backgrounds, sound effects and songs that are all hand-crafted to fit each specific set of levels. Stay tuned for new updates. New levels are always being added. Features by far the most challenging puzzles in the series to date. Use everything you have learned in the Angry Birds franchise to topple those piggies once and for all! Play whichever set of levels you like best. There’s no need to unlock new stages by beating the earlier ones. The flock includes a diverse range of personalities, each of whom brings some unique talents when loaded into the slingshot. 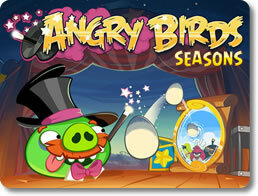 Angry Birds Seasons not only includes everyone from the original game, but introduces a few new members to the mix. Use Red the red bird as your basic projectile. He can knock anything down with his weight when given the right amount of momentum. Fling Chuck the yellow bird. He can take out wooden debris like nobody’s business, as well as get a second burst of speed in mid-air. The blue birds are an odd lot. While they’re airborne, they can split into three separate birds and cause destruction on a wide scale. Bomb the black bird may be the most selfless member of the flock. Anytime after he is launched, he can blow up like a bomb to take out the heavy junk that’s getting in everyone’s way. Matilda the white bird may be a little antsy, but even her nervousness can be useful By laying an egg in mid-flight, she can get a much-needed vertical boost while destroying anything directly beneath her. Terrence, also known as Big Brother Bird, is the biggest bird of all. Use his bulk to destroy everything that gets in the way. Hal the boomerang bird can spontaneously change direction and nail pig structures that are otherwise unreachable by the others. Bubbles the orange bird may be small, but with a tap of the screen, he can inflate like a balloon and destroy buildings from the inside. Stella the pink bird can trap items and pigs in soap bubbles and get them out of the way by lifting them in the air. Angry Birds Seasons is the gift that keeps on giving. The good folks at Rovio have provided the game with a great number of updates to make it a tremendous value for your dollar. 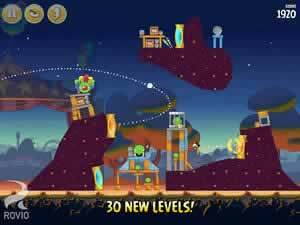 It boasts more levels, more puzzles, more challenges, and more birds than any other Angry Birds title to date. It’s only going to get bigger from here. Get this game and celebrate your favorite holidays with the flock.